Scooper - Technology News: What's the future of the construction industry? Unlike other industries, the Engineering and Construction sector has been slow to adopt new technologies, and has certainly never undergone a major transformation. As a result, productivity has stagnated over the last 40 years, or in some cases, even declined. This unimpressive record looks set to change very soon, and very dramatically. In fact, profound changes are already taking place – though not yet on a sufficiently wide scale – in many aspects of the construction industry. The writer William Gibson’s famous phrase fits the industry perfectly: The future is here today – it is just not evenly distributed . The key is digitalization. More and more construction projects are incorporating systems of digital sensors, intelligent machines, mobile devices, and new software applications – increasingly integrated with a central platform of Building Information Modelling (BIM). The challenge now is to achieve widespread adoption and proper traction. Wherever the new technologies have properly permeated this fragmented industry, the outlook is an almost 20% reduction in total life-cycle costs of a project, as well as substantial improvements in completion time, quality, and safety. Technological advances are now revolutionizing almost all points in the life-cycle of a built asset, from conceptualization to demolition. 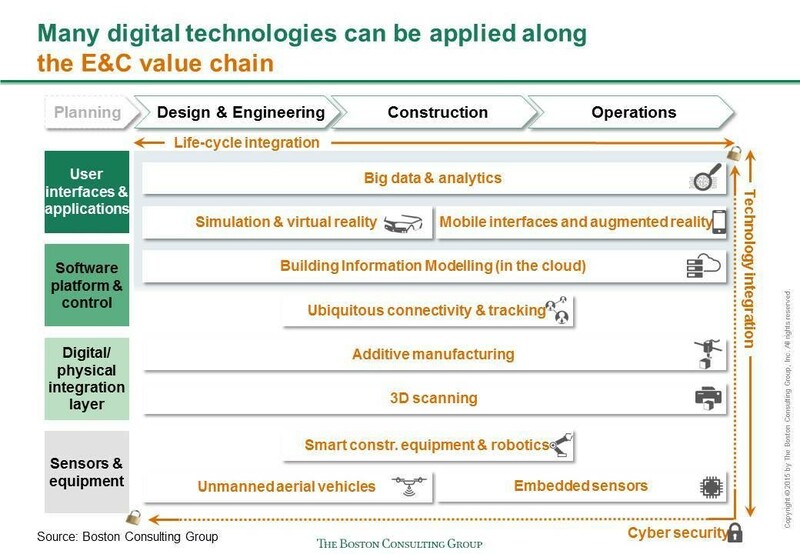 The chart below shows the relevance of digital technologies along the engineering and construction industry’s value chain. Digitalization is transforming all three major life-cycle phases of construction projects. Consider the following scenario – no longer futuristic, but “here today”, though its building blocks are still distributed patchily over disparate projects. During the Design & Engineering phase, BIM identifies potential design clashes and constructability issues, thereby averting costly corrective rework; and it improves the tendering process by making the information more transparent and accessible. An interesting example is that of Crossrail – one of the world’s largest and most complex infrastructure projects, building a major new underground line across London: the designers and engineers are using a centralized set of linked BIM databases to integrate about 1.7 million CAD files into a single information model. During the actual Construction phase, drones survey and inspect the construction site. 3D printers prefabricate many of the building components. GPS and radio-frequency identification (RFID) are used for tracking the materials, equipment, and workers, in order to then optimize flows and inventory levels. Robots and autonomous vehicles do much of the actual building work. 3D laser scanning or aerial mapping is used for comparing work-in-progress against a virtual model, thereby enabling prompt course corrections and minimizing corrective work. Take the case of a Japanese equipment manufacturer that has developed fully autonomous bulldozers, led by drones that map the area in real-time to provide data on the workload. During the Operations phase, embedded sensors continue to monitor any given part of an asset, checking for deterioration, facilitating predictive maintenance, and continually updating a central database. Augmented reality is used for guiding maintenance crews. Big data – on traffic movements, electricity consumption, and so on – are collected digitally, and are subjected to advanced analytics, in order to optimize decision-making and generally boost operational efficiency. By way of illustration, consider the approach taken by the Japanese building service provider NTT Facilities to the inspection, maintenance and repair of their R&D premises: by integrating the BIM model into the building’s facility- and asset-management system, and making intelligent use of this combined resource, the company was able to reduce the cost of operations and maintenance by an estimated 20%. On average, uptake of these transformative technologies has been slow initially. They have faced some resistance to adoption, and some companies that do deploy them have struggled to capture all the potential benefits. The obstacles are being overcome, however. More and more companies are now embracing the opportunities, with productivity starting to rise and promising to soar. Within ten years, according to our estimates, full-scale digitalization will lead to huge annual global cost savings. For non-residential construction, those savings will be $0.7 trillion to $1.2 trillion (13% to 21%) in the Design & Engineering and Construction phases; and $0.3 trillion to $0.5 trillion (10% to 17%) in the Operations phase. Note that the productivity gains will vary not only across the life-cycle phases but also across the sub-sectors: vertical, industrial, and infrastructure. The chart below, based on a study of construction projects from each of the sub-sectors, shows the variation in detail. The gap between digital leaders and laggards is widening – for construction companies themselves, for technology providers, and also for governments in their role as project owners and regulators. All these stakeholders need to master the dynamics, upgrade their competencies and investments, and adapt their processes and attitudes, or risk losing out competitively. Read the report Shaping the Future of Construction – A Breakthrough in Mindset and Technology . It was written under the umbrella of the Future of Construction Initiative launched in 2015 by the World Economic Forum, with The Boston Consulting Group as knowledge partner. 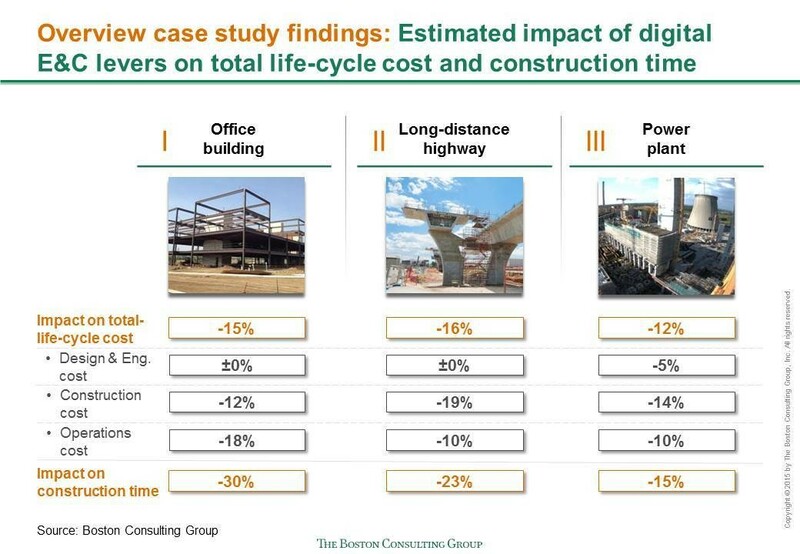 Read also Digital in Engineering and Construction: The Transformative Power of Building Information Modeling , a report recently published by The Boston Consulting Group.